The birds are chirping and spring has officially sprung (excuse the cliche) so it’s time to transition your skincare routine from winter to spring. Up your skincare game with green, eco-friendly products – just in time for Earth Day (April 22nd). Whether you’re purifying, prepping, or primping, brands like ACURE, Florapy Beauty, Fizz & Bubble, Ethique Beauty, Dr. Hauschka, Earth Therapeutics, and John Masters Organics have you covered. Purifying Fruit Peel – A five-minute detox for dull skin, the ACURE Purifying Fruit Peel features a papaya enzyme, bitter cherry and blue agave mixture to gently remove dead skin cells and decongest pores. Mango, raspberry, cranberry, orange and lemon extract leave skin refreshed and glowing ready for warmer temps and less makeup. 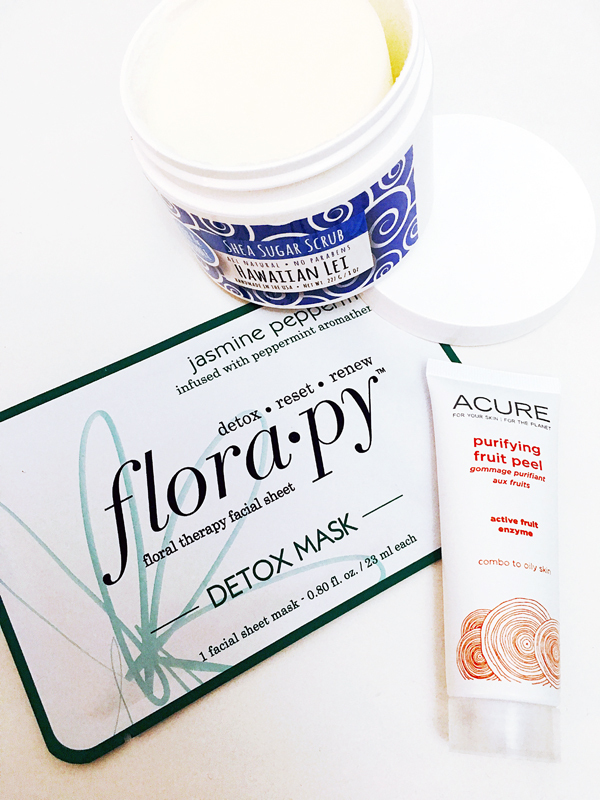 The Jamine Peppermint Detox Mask from Florapy Beauty is known for revitalizing properties: Jasmine flower helps stimulate the skin, promote elasticity and reduce the appearance of fine lines while the peppermint aromatherapy refreshes dull, tired skin and helps promote circulation for clean, supple and youthful feeling skin. INSIDER TIP: I keep this mask in the freezer for 5 minutes when it’s warm out for a refreshing experience. Hawaiian Lei Shea Sugar Scrub from Fizz & Bubble boasts shea butter and vitamin E with a rich sugar blend to slough away surface cells and reveal radiant looking new skin. This scrub will become your best friend pre-beach, pool party, or before you slip on that sundress. 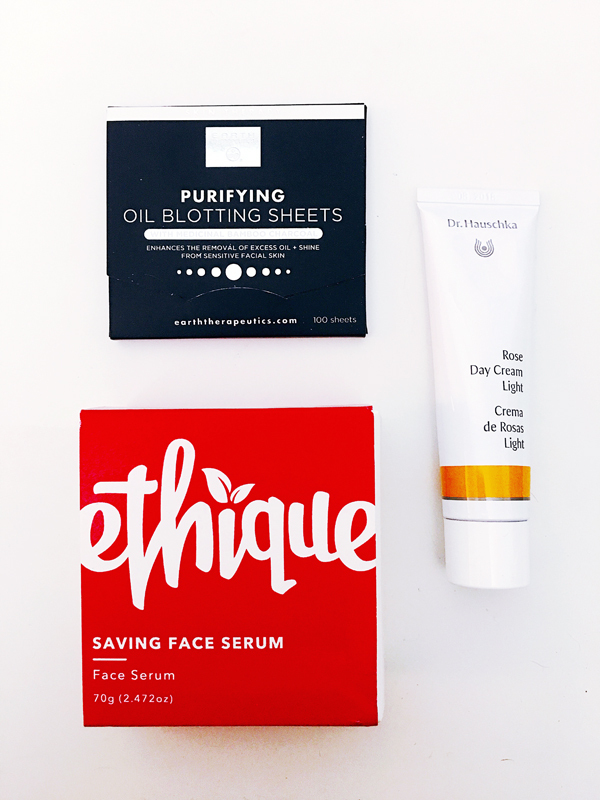 Saving Face Serum by Ethique Beauty can be used two ways; either as a nutrient and hydration booster under your normal face cream or as your only moisturizer. Made with Cupuacu, Shea & Illipe butters and Rosehip & Pomegranate oils the serum promotes firm, hydrated skin without leaving a greasy residue so makeup (if needed) can be applied after. Dr. Hauschka’s Rose Day Cream (which is celebrating 50 years!) captures the strength and softness of the rose to nourish and protect normal, dry and sensitive skin. If you’ve spent a day in the sun this cream is ideal to calm skin and minimizes the appearance of redness, irritation and couperose. Purifying Charcoal Oil Blotting Sheets from Earth Therapeutics will keep your face oil + shine free without smudging makeup or leaving marks. Specially infused with purifying bamboo charcoal for an added cleansing effect to leave the face extra fresh. Nobody likes a shiny face, ladies! 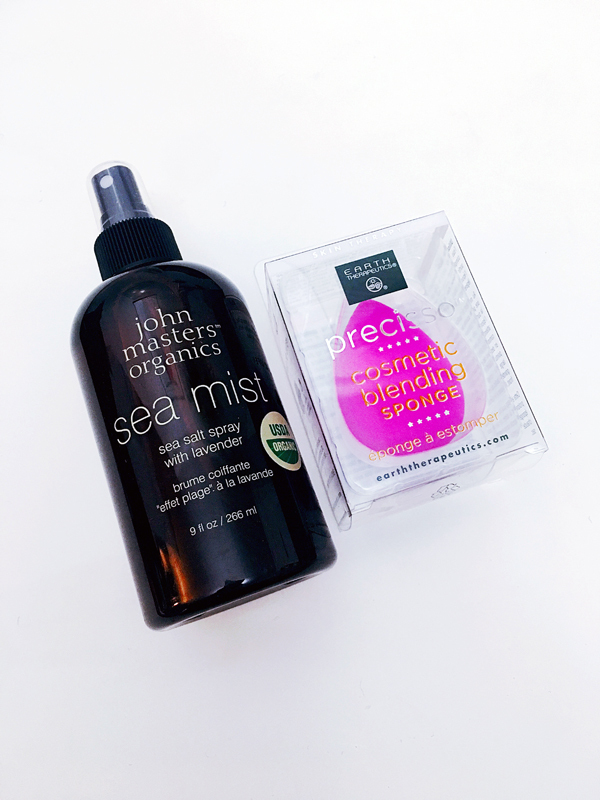 If you aren’t lucky enough to have natural beach babe waves, John Masters Organics’ Sea Mist Salt Spray boasts organic sea salt, which promotes the texture and volume of “beach-hair” while certified organic lavender naturalizes the scalp and protects hair from drying. There are plenty of blending sponges on the market but I’ve found that the Precisso Cosmetic Blending Sponge by Earth Therapeutics is an eco-friendly alternative to the universally loved blending sponge. Hypoallergenic and non-latex, the tip of the sponge allows precision application in hard-to-get-areas and the rounded end allows for efficient, even distribution of all types of makeup. Whether you’re just applying a bronzer or minimal spring makeup, this sponge does the trick.